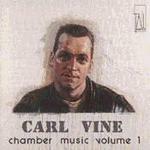 Chamber music, volume one / Carl Vine. Instrumentation: Flute (doubling piccolo and alto flute), trombone (or cello), percussion, piano. First performance: by Flederman — 17 Jan 83. University of Nevada, Las Vegas, Nevada, U.S.A.
17 Jan 83: University of Nevada, Las Vegas, Nevada, U.S.A.. Featuring Flederman.